I had the pleasure of working with Interactive Touch Books (ITB) and recently interviewed Ameen Saafir, founder/CEO about his company. The goal of ITB is to offer “A truly interactive reading experience for the iphone and ipad.” Below Ameen explains how authors and illustrators can create an original interactive book or work with ITB to have their designers create your book. (And with ITB you don't have to wait for Apple to approve your App.) 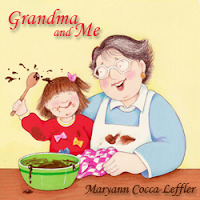 My ITB title is GRANDMA AND ME published in October, 2011. I worked with ITB designer Stacy Russell, who used my existing art from an out-of-print Random House title. Stacy did the work of adding the interactive elements and sound. My experience with ITB has been very pleasant and professional and I was very pleased with the results. Thank you Ameen for taking the time to answer my questions. In a paragraph tell us about Interactive Touch Books. When did you get started? What is your position and your history? The idea for Interactive Touch Books began to form over a year ago when I noticed that my then 18-month old son found the iPad incredibly intuitive to use. What I found surprising was that there just wasn’t a lot of quality content (e.g. interactive books) available for young children. As I began talking to children's authors and illustrators, it became clear that the issue was not a lack of desire to create app versions of their books, but of resources. It is very expensive to create a children's app for iPad. So I left my engineering career (designing flat screen TV technology) behind and started Interactive Touch with the goal of creating a platform that would let professional author illustrators create interactive books for children for very little upfront cost and without needing to write any code. How many titles do you currently have? Who is your audience? How does the public access/buy your books? What e-reader is needed to “read” your books? We currently have 38 titles, all available for download through the free Interactive Touch Books app on iPhone, iPad, and iPod Touch. Our target audience is 1–10 year olds. Books can be purchased directly through the app or at our online store (store.interactivetouchbooks.com) but are only readable through our app. How does an author/illustrator go about creating an Interactive Touch Book? Whether an author wants to create an original book for iPad or translate an existing one into digital form, the process is the same. We give authors two options for accomplishing the process. 1. The author can use our online interface to create the interactive version of the book. Our team is available basically 24/7 to provide technical support and can walk an author through implementing a wide variety of effects. 2. You can allow us to create the book for you from your art. This can be for a book that has already been published or it can be a brand new idea. We accept art in almost any format. To create greater interactivity, we prefer .psd [Photoshop] files with background and foreground images on separate layers. However, we have created books from original canvas art and even scanned pages of a published book. This will generally require us to fill in some background art in order to allow characters to move around on the screen. 1. Fee for ITB to create book from existing art? 1. For the vast majority of books, we charge $500 to convert a title for an author. This includes implementation of art, sound effects, and interactive elements. Books are typically completed and live on our app within about 2 weeks of the start of the project. This production schedule may vary depending on the length of our project queue at the time of project submission. Should the project be delayed we will communicate that clearly before agreeing to take it on. If the author/illustrator creates the interactive version of their book primarily on their own (we are always here for an assist or to answer questions) then it is free to create and publish. 2. The author/illustrator retains all rights to work that is created and published through our platform. This differentiates us from traditional publishers. Our only requirement is that the author does not publish the same material as an interactive book on a different platform. However, the author is free to sell static ebooks or print versions of the book elsewhere. Authors receive 70% of net proceeds after 3rd party fees (e.g. Apple on iTunes). This translates to 49% of sales from in-app purchases and roughly 65% on purchases from our online store. We are very actively looking for high quality educational content as well as puzzles and activity books. Our biggest challenge has been to construct a platform that is powerful enough to create amazing interactive books, yet simple enough that anyone can use it. Look into the future…where do you think the ebook industry is going? I believe that we are only seeing the tip of the iceberg in terms of the potential of digital books. Right now, ebooks typically look like electronic versions of print books, which is only natural when translating existing media onto a new platform. At Interactive Touch, we believe we have a unique vision for re-imagining how stories are told using digital platforms, which we will start bringing to market in the next few months. It is too early to predict what will happen to the industry in the long term, but as we look back on similar technology revolutions there are a few constants. We can expect to see a lot of consolidation in the next couple of years, and whoever ends up leading in the space will likely be someone most people have not heard of yet, and will definitely not be a traditional publishing house. I’d add that what authors/illustrators can expect from Interactive Touch is an amazing technology supported by a team of hard working professionals who will do whatever it takes to make sure every need in the creation process is met. The best testament we get to the quality of our platform and our team is that every author who completes a book with us start working on their next book almost immediately.